With winter just creeping round the corner, it’s time to think about keeping your home feeling warm and inviting as the temperature starts to fall. Let’s face it, all of us crave a beautiful meal setting for our dining experience. A well designed dining space can offer comfort and that all important inviting atmosphere. Don’t be afraid to mix it up a little. Adding a mixture of colours and materials could make your home look stylish, modern, and unique. Using fall’s rich colors to recreate a cozy, welcoming, and relaxed look where you can have spirited conversation with family and friends. Decor8 Hong Kong furniture would like to help gain the warmth and comfort vibe in your interior space. We would like to point your attention to the Whittier Fabric Armchair. This chair comes with a few combinations in terms of leg colour and shell colour. This makes it adaptable in most dining spaces whether you have a light colour theme or a dark one. The Whittier Fabric Armchair comes in two parts. You have the legs which can be constructed in natural birch light wood or the darker walnut colour. These legs are attached to the upholstered shell with steel connections giving you a sturdy chair. The shell is made out of ABS plastic with a little padding before being upholstered with premium fabric. The colours that are available for the shell are light grey, charcoal grey and dark brown. Now that you’ve decided upon this stunning looking chair, you’ll need some other furniture pieces to complete the look. You may be overwhelmed by the sheer amount of wonderful products in our collection so why not visit our showrooms. This will allow you to see the products in person. 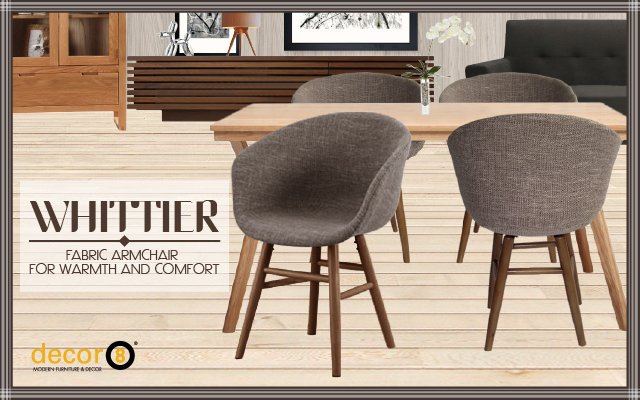 Get your Whittier Fabric Armchair for warmth and comfort whilst it’s still on sale! This entry was posted in Dining Chair, Seating, Side Chairs and tagged armchair, armchairs hong kong, comfort, dining chair hong kong, dining room, dinner party, dinner time, fabric chair, family time, leather chair, modern chairs, oak chair, relax, seating, stylish.